Before starting we had lost Nigel Guppy, who was unable to travel in time and Trevor due to injury, although the great bonus was Trevor was able to run the bench. Our first game was against a surprisingly strong Italian team who turned out to be largely made up of their national 60s team. Roger was also nursing a strain which meant that our defence was very much makeshift. We started well and had most of the pressure but a couple of quick breaks saw us concede two goals to an Italian forward line who knew what they were doing. One was from a well worked short corner. Not the start we expected 0-2 ! In our second game against a Dutch side we again applied pressure and quickly gained all the territorial advantage. A change to bring Sarosh into midfield gave us greater penetration. This time we scored an early goal through Max and then built on it with two more goals – one from Max and a short corner from Graham. This was a better result 3-0. The ‘unusual’ scheduling of matches saw us play the Italian team for a second time with the opportunity for revenge. Better prepared and more organised in defence, we again had the territorial advantage to start with but couldn’t stop the Italian forwards taking an early lead. However we equalized fairly quickly through a Max shot from a tight angle. A great performance from Tim in an unusual defensive position and Eric in goal kept the Italians out. Better umpiring at the other end would have seen us awarded a flick and at least two short corners, however the scored ended 1-1. Our 4th game saw us produce our best performance against a very good Dutch side containing one or two recognized national players. By now our defence had settled down with Roger and Nick in the center supported by Mick and John Tripp. Sarosh, Graham and Steve gained midfield control whilst Max and Tony gave us penetration up front alongside Paul with his endless energy. Tim came on to score his goal and we finished the game 1-0 up. Great team work and great result. A good performance can sometimes be followed by a poor one, and so it was in our 5th game against the same Dutch team that we had already beaten 3-0. We had all the pressure but could only score one goal through Max. Several misses and a good display from their goalkeeper kept the final score to 1-0. Although some said we made him look good ! Our goal scoring did not improve in our 6th game against the Scottish Thistles. Again we had all the pressure and John Housham quickly won a penalty flick. However that was missed and three other chances went begging. Determined defending by the Scots saw the game end in a 0-0 result. We had played six games, two against the same opposition and one against a team from another group. Much to our surprise, and that of the Italians, we had won our group by virtue of having played one more game than them – Dutch rules ! So we found ourselves in the final as winners of our group up against a Dutch side, winners of the other group. It was another great performance that we seemed able to produce against the better sides. Our defence, marshaled by Roger, was like a rock which we built on with an early lead from a Graham Jackson short corner. Then eight minutes from the end Paul scored a second goal, after good work on the byline by Max, giving us a 2-0 victory. All 13 players played in the final which we won by a great team performance. Thanks to Roger for bringing the oversize trophy back to the UK and to the ladies for their unswerving and vocal support and making the BBQ and Dinner Dance social events very enjoyable, as was the whole weekend. The Tilburg Tournament was a first for LX as well as for the organisers and it showed in the game scheduling. Despite being arranged in two pools, the +68 teams found themselves playing some teams twice and some not at all! LX began the tournament with a game against the weaker of the two Dutch sides. Despite seven short corners and lots of other chances they failed to find the net and so drew 0-0. This was followed by a match against the stronger Dutch team, mostly their international 70s. The Dutch opened-up a two goal lead but LX fought back gallantly. Mike Surridge astutely lobbed the keeper for 1-2 and then Graham George deftly chipped a drive from John Maylam to force a well earned 2-2 draw. Day 2 opened with a goal-fest against Alliance. Goals flowed at regular intervals from John Maylam, from a short corner, Adrian Stevenson, from a Rod Cochrane centre and John Maylam again, with a firm push from just inside the circle. Alliance pulled one back on one of their rare ventures into the LX half but LX responded with further goals from Graham George, with a deflection from a firm John Maylam cross and Adrian Stevenson made it 5-1 from a Mike Surridge pass. 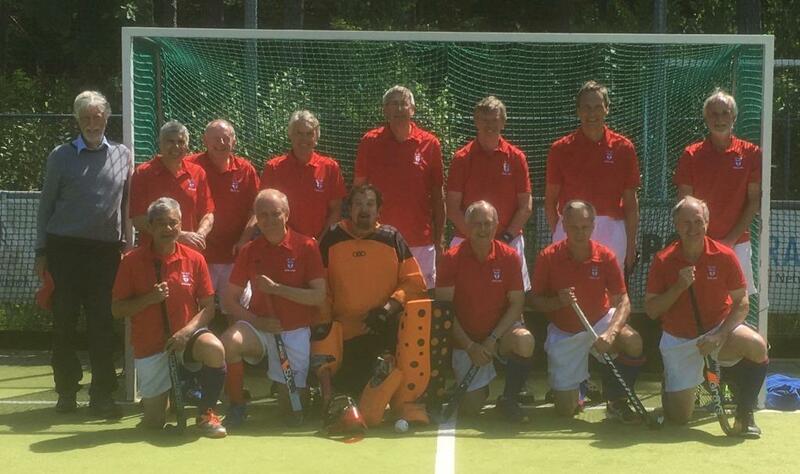 The second match should have been against the Dutch 75s but they were "too tired" so an impromptu game against the England Ladies 60s was hastily arranged. A very social and enjoyable match ensued, with the Men coming out on top. The final match of the day was a must-win return fixture against the weaker Dutch team. This time LX made no mistake and turned on an excellent performance. Rod Cochrane opened the scoring with a powerful flick and Adrian Stevenson made it two with a great trademark shot. Although the Dutch pulled one back, LX had all the play and 2-1 took them into the final. The Tilburg Club hosted the Tournament Dinner on Saturday night and it was a very well organised event. 300 people had a tasty sit down meal, serenaded by a Dutch Jazz Band . Despite aching limbs, there was much dancing and frivolity. 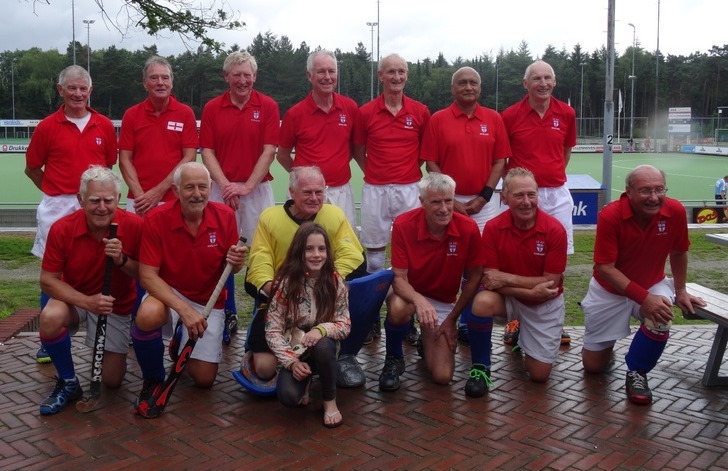 Sunday saw LX pitted against Belgium Old Lions in the final. LX had all the play, forcing numerous short corners, but to no avail. Then disaster struck in the last minute when a rare Belgian attack resulted in three successive umpiring errors, culminating in a short corner in the last second of the game, from which Belgium scored. Although elated, Belgium were somewhat embarrassed by their undeserved victory.